The fight lineup for Buffalo Thunder’s May 10th “Latin Collision” boxing card presented by Holmes Boxing and Orthrus Promotions is finally set. Nogales, Mexico’s Felipe Rivas, who has lost four of his last five fights. The bout will take place at both men’s weight-class of Super Flyweight. In the co-main event, hard-hitting Brandon Holmes looks to keep his perfect 3-0 record as he faces Albuquerque’s Eric Gonzalez who is coming off a nearly two-year layoff. His last bout was on the second Holly Holm vs. Anne Sophie Mathis card, in one of the better fights that evening. Also on the hard is the always entertaining Angelo Leo, and we’ll finally (fingers crossed) get to see the debut of Brian Mendoza, who was scheduled on the last Buffalo Thunder card but whose fight ultimately fell through. 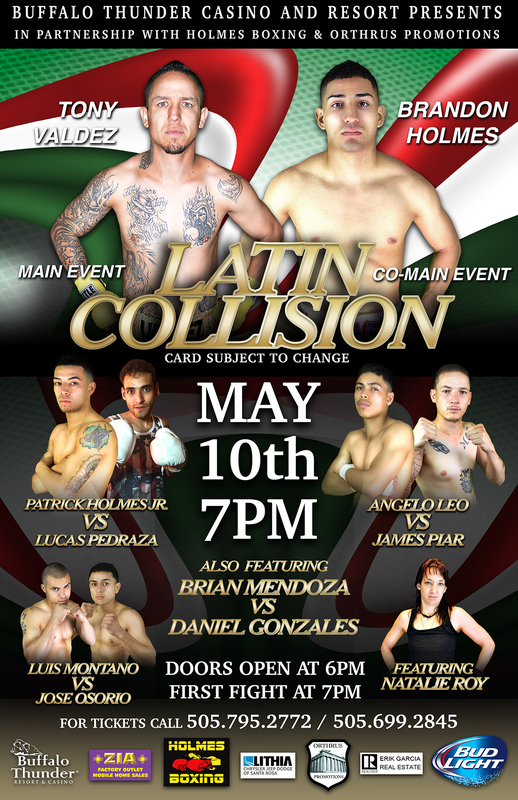 The official weigh-ins for Latin Collision will take place on Friday May, 9th insdie Shadeh Nightclub at Buffalo Thunder Casino and Resort. Weigh-ins will begin promptly at 2pm local time. The fights are expected to air live on www.OrthtrusPromos.com. The first bell on May 10th is set for 7pmMT at the Buffalo Thunder Casino and Resort just north of Santa Fe. Tickets prices range from $30.00 – $75.00 and can be purchased by calling 505-795-2772 / 505-699-2845. It is always suggest that you buy them from one of the fighters on the card.